Another new country that should not be too hard to get in the log but did not happen until today: South Africa. ZS6ZA was active on 40 meter FT8 and received my answers. I have now tried FT8 on the 2 meter band several times. One time I received a message via FT8 to try it on the 70cm band too but I haven't figured out the right frequency on that band yet. DX contacts have been made into England, France and Germany. Furthest 2 meter contact at the moment is 323 kilometers. From the doppler shift I see the most probably reason for these distances is aircraft scatter, which means I'm using big metal reflectors in the sky to bounce my signal, without even paying for an airplane ticket. I'm looking forward to 'E-skip' and other phenomena that can make 2 meter radio signals reach larger distances. I wonder what that will bring me. This evening another two new countries in my amateur radio log: Lebanon and Gibraltar. First OD5ZF from Lebanon and 4 minutes later ZB3M from Gibraltar. That makes three pairs in two months. These two were both in FT8 mode on the 40 meter band. FT8 is very good at fast contacts at low received signal levels. A special first for me: an amateur radio contact with Australia, with VK3EW who seems to be a serious DX chaser. For me, this is almost the other side of the world. This was an FT8 contact, which is a digital mode specific for making contacts with very weak signals using the minimal exchange of information to have a valid contact. I think the neighbours have heard my happy shout after I saw the first response come back to me. The exciting part was making it a full contact complete with signal reports exchanged. The distance of this contact is 16581 kilometers! 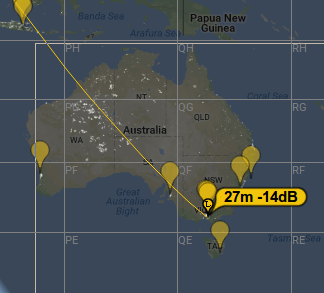 The scaling of the generated maps at PE4KH amateur radio has been adjusted to make this contact visible. This weekend was the CQ World Wide DX Contest. This is indeed another phone (voice) contest, so I connected headset, footswitch and the remote head of my radio. I had some time to participate on Sunday early afternoon and Sunday evening. On Sunday afternoon the logical band to try was 20 meters, on Sunday evening 40 meters. In the end I made 51 contacts. All I did was 'search and pounce', checking for stations calling CQ that I could understand good enough and transmit my call back to them in the hope they would hear me. Some stations had me on the first try, some took several tries and some never heard me. The DX that got away was a Kazakhstan station who could not decode my call even after several tries. I used the yfktest contest software for Linux again. This wasn't very hard as yfktest has a standard definition for the CQWW DX contest. I heard both serious contest stations and single operators just calling CQ on the air. Interesting was to work OH1LWZ/M who according to his qrz page is really contesting mobile from his car or bicycle. For next time I have to check the compression and gain settings for SSB on my Yaesu FT-857D radio when using the headset. A few times I heard the contest call PA0AA of my radio club who worked very hard to get the antenna at the club ready for contesting, but only in the background when I was trying other calls. It would have been nice to get them in the log.